Happy International Women’s Day to all the lovely women of the world. Below, from our scriptures, is the high regard the Sikh faith have for women. Just the line “So why call her inferior from whom kings are born” says it all. Also just as all Sikh males have the same common name Singh (meaning Warrior), females have the same common name Kaur (meaning Princess). It preaches help for the poor and loving thy neighbour but now a new study has provided evidence that religion can make people more generous in their everyday lives. Research commissioned by the BBC found that people who profess a religious belief are significantly more likely to give to charity than non-believers. Sikhs and Jews emerged as the most likely to share their worldly goods with a good cause, just ahead of Christians, Hindus and Muslims. The study, carried out for the BBC’s network of local radio stations, included polling by ComRes of a sample of more than 3,000 people of all faiths and none. It found that levels of generosity across the British public are strikingly high, but highest among those with a religious faith. We are all creations of God and we must never forget that. Compassion is the key! What food might this contain?” The mouse wondered – he was devastated to discover it was a mousetrap. The snake bit the farmer’s wife. The farmer rushed her to the hospital , and she returned home with a fever. So, the next time you hear someone is facing a problem and think it doesn’t concern you, remember when one of us is threatened, we are all at risk. We are all involved in this amazing journey called life. We must keep an eye out for one another and make an extra effort to encourage one another. Each of us may not be connected through a blood line, we may not even be friends. But we are all connected through humanity. Share this wisdom with the intention that others may benefit from it too. by Sujay Kumar | December 3, 2015 12:00 p.m. But what happened to Mukker was a brutal anti-Sikh hate crime that left the 53-year-old with a fractured cheekbone, an eye swollen to the size of a plum, and his white shirt soaked with blood. That’s how Harvind Kaur Singh said she felt in September after being told that her cousin was beaten only a few blocks away from his house in Darien, a suburb 25 miles outside of Chicago, where he has lived for 27 years. Mukker, held by his seatbelt, was trapped like a hamster in a cage. Inderjit Singh Mukker after he was attacked. The attack on Mukker is the most high-profile anti-Sikh hate crime in the nation since the FBI started recording the data in 2015. This year, for the first time since 9/11, violence against Sikh Americans—who are often mistaken for Muslims by their attackers—is not just considered collateral damage in the pursuit of Islamophobia, but broken out it into its own category in federal reports. Mentioning a dastarr and kanga may not seem momentous, but consider that before this year, incidents of hate-fueled violence against Sikhs were stuffed into the numbers of anti-Muslim hate crimes. For most of the 2000s, the more than 300,000 American Sikhs in the nation were forced to grapple with a question: How do you feel like you count as a citizen when crimes against you aren’t even counted? Everything changed on August, 5, 2012, when white supremacist Wade Michael Page opened fire at a Sikh temple in Oak Creek, Wisconsin, killing six and catapulting violence against an often ignored people into the spotlight. 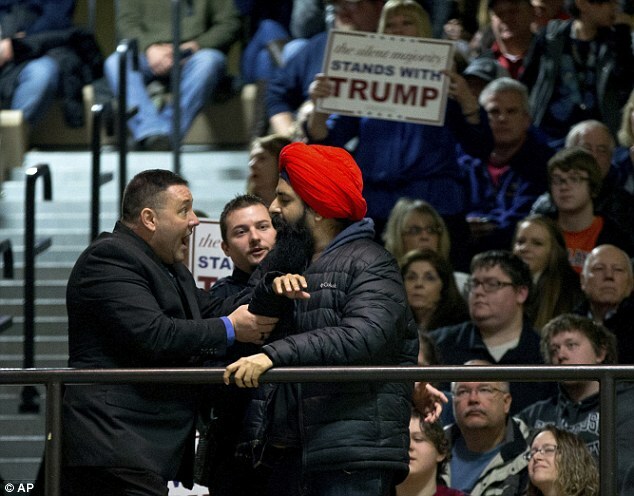 “When you have the spotlight and the nation’s sympathy is with you, you essentially get one request,” said Simran Jeet Singh, religion fellow at the Sikh Coalition, a group formed to protect the civil rights of American Sikhs. Reforming the FBI statistics, Singh said, was the stricken community’s one request. Enough was enough. The FBI had essentially said attacks against Sikhs weren’t significant enough to be tracked separately, but the massacre of six innocent Sikhs proved otherwise. Today the doors on the temple are locked, there have been $75,000 in security additions (24 cameras, bullet-proof windows, safe rooms that can house 500), and Sikh Americans have the dignity of being a statistic. The shooter’s motive will never be known for sure. He killed himself before he could be arrested. Anti-Sikh sentiment was amplified after 9/11—there werean estimated 200 cases of anti-Sikh hate in the days after the terrorist attack, according to a Sikh organization—but it wasn’t born in the rubble. The price of wearing a turbanwas not a new phenomenon. In the ‘70s Sikhs were calledKhomeini (Iran), then Saddam Hussein (Iraq), then bin Laden (Saudi Arabia), and now—for example, when aiding Syrian refugees—as ISIS. Even in India, “Sardar jokes,” which are basically blonde jokes, are rattled off at the expense of Sikhs. 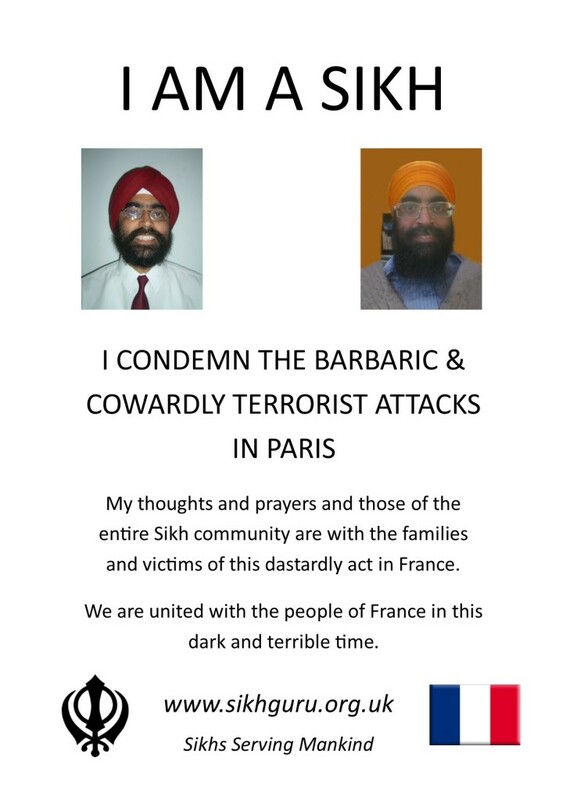 Last month, a photoshopped selfie of Canadian Sikh Veerender Jubbal, making him appear to be one of the Paris terrorists, went viral. In the doctored photo, Jubbal’s iPad was changed to a Quran and his flannel shirt was now covered by an explosive vest. A few days later, after outcry from the Sikh Coalition and a more thorough review of the evidence, the State’s Attorney’s Office filed a hate crime charge. (The teen also faces five counts of felony aggravated battery—one for punching a police officer who arrived at his house to arrest him). It is unlikely the case will be moved to an adult court. Mukker’s cousin, Harvind Kaur Singh, said she wasn’t surprised that authorities had to be prodded into adding the hate crime charge. She has two daughters, 11 and 7, who keep their hair long, while her husband wears a turban. She said that the girls often ask about what happened to Mukker, who they call their uncle. Harsimran Kaur, legal director of the Sikh Coalition, said the police’s initial oversight was telling: prosecutors and law enforcement must be culturally competent enough to understand that being told things like “go back to your country!” is evidence of bias. It’s not enough to notice that Mukker was beaten senseless. Motive matters. To prove a hate crime, prosecutors have to show evidence of religious-fueled malice at the moment of violence. When an attacker yells a racial epithet, this becomes obvious. Family from India landed in Chicago the day after his brutal attack, a visit planned months earlier. They were shocked that something like this could happen in America. I asked whether Mukker is angry. There’s a common, though misguided, refrain for Indian immigrants in the face of racism: America will never be our country. 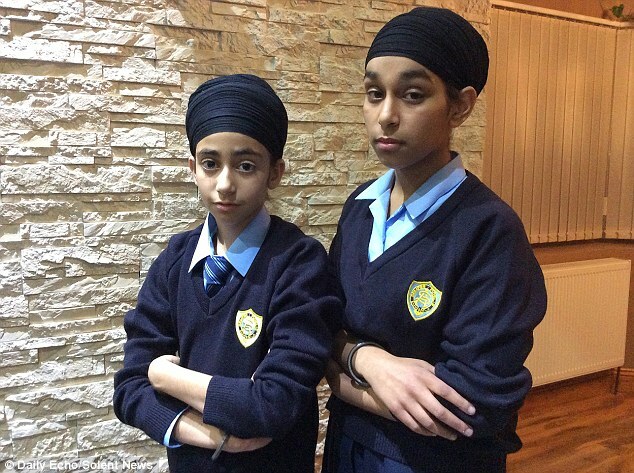 A school head teacher has apologised to two Sikh girls after they were ordered to remove their turbans on the first day of term. Simranjot Kaur, 13, and 11-year-old Prasimran Kaur, who aren’t related, returned to St Anne’s Catholic School in Southampton, Hampshire, wearing their traditional religious headwear. Newly enrolled year seven student Prasimran was told to take it off shortly after walking into school, while Simranjot, who is in year nine, said a teacher spotted her coming through the gates yesterday. Both of the girls, who are baptised Khalsa Sikhs and take the mandatory female surname Kaur, refused to remove the headwear which can be worn by both sexes in their religion. They claim the school suggested they were wearing them for ‘fashion’ and that they should be replaced by headscarves usually worn by Muslim women. Simranjot says she was forced to take hers off after staff began unravelling it, something which Sikhs regard as highly disrespectful, and her mother arrived at noon to take her home. Their furious families have blasted the school for what they say are ‘discriminatory’ rules. Prasimran’s Jaskiran, 18, a former pupil there said: ‘It’s discriminatory. They are a Catholic school and are supposed to support equality. Men and women who have been initiated into the Sikh faith are known as the Khasla. 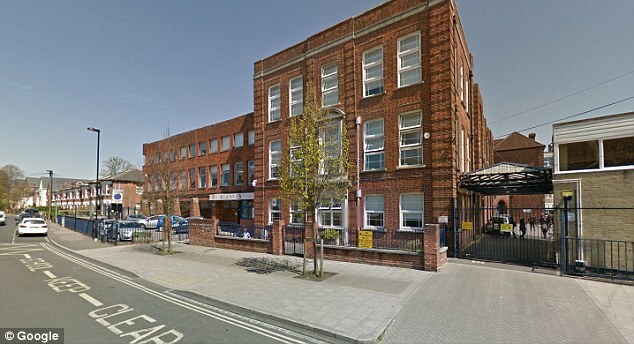 However, the school has said it was a ‘misunderstanding’ and apologised to both families. In a statement, head teacher Lyn Bourne said: ‘I would like to apologise to students and parents for any offence caused by our enforcement of our uniform policy this morning. ‘The situation that occurred was a misunderstanding and I can confirm that both girls involved now have permission to wear a turban to school. ‘These should be plain navy blue or black until we are able to identify an appropriate supplier. Southampton City Council cabinet member for communities Satvir Kaur, a former headgirl there and a practicing Sikh said: ‘It hasn’t been a great first day back but I’m pleased the situation has been resolved. 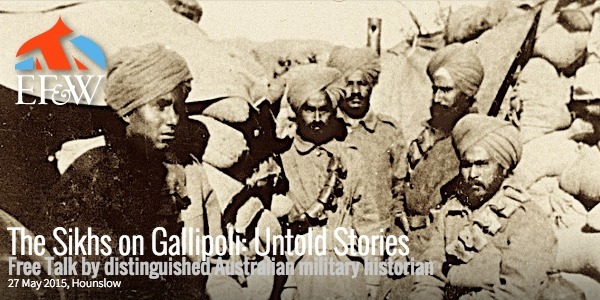 The Sikhs on Gallipoli: Untold Stories. Free Talk by distinguished Australian military historian (27 May, West London)Exactly 100 years ago Sikh soldiers were fighting for the British empire on the Gallipoli peninsula in Turkey. Though many Sikhs know some of this history – such as the sacrifice of the 14th Ferozepore Sikhs in the attack of 4 June – in the century that has passed no book has appeared devoted to the experience of Indian soldiers on Gallipoli. It has taken one of Australia’s most distinguished military historians, Professor Peter Stanley, to tell this story, and later this month his book ‘Die in Battle, Do not Despair: the Indians on Gallipoli, 1915’, will be published by Helion & Co.
UKPHA are delighted to announce an exclusive free talk by Peter. He will tell some of the stories of Sikh soldiers on Gallipoli, both men of the Ferozepore Sikhs, mountain gunners, men of the Patiala Infantry and transport drivers. He will be talking about individual Sikh soldiers, rescued from obscurity a century on, partly thanks to families who have preserved stories that can now be told. Don’t miss your chance to hear their story at this very special event. The Speaker – Professor Stanley who is over from Australia where he is Research Professor at the University of New South Wales, Canberra. He has written 27 books, mainly on Australian military history, and appears frequently on television documentaries. He now writes mainly about the Great War of 1914-18, though his most recent book was the Cunning man, an historical novel set in the First Anglo-Sikh War. The next “Feed the homeless” event will be at Lifeshare Limited in Manchester. We shall meet on Friday 27th December 2013 at 6.30pm at Gurdwara in the evening to prepare all the ration for cooking / serving. Look forward to seeing you all on Friday / Saturday or both, to make this event a success and feed the homeless/needy with hot food when they need it most at this time of the year. A young child went to a holy man and stated that no matter how hard he tried to keep prayers and hymns in his heart, he just could not understand or keep it. He stated that his mind was not a bucket, but a strainer which let everything pass through and did not contain the meaning of the prayers. The holy man said ” Let us try an experiment. Here is a strainer, and here is some water. Now pour a bucket of water through the strainer.” The child did this and said “See, the water was not contained, it just passed through, my mind is just like this”. The holy man said “Do it once more” and so he did and still the water passed through the strainer. The holy man said. “Do it ten times at least”. The child did, and at the end of this experiment, he said ” See, water still passes through, no matter how many times and how many buckets we pass through it” . The holy man said “My son, this is what reading and reciting prayers does for you. It cleans your mind, and even if you do not realize it, it slowly cleanses your mind, and protects you from the evil vices in life. The more you read and recite prayers, your mind will not only become shinier, but become like the bucket itself, which will not only become clean , but hold the meaning of the prayers in your heart”. The child smiled and felt he had received the best example of the power of reading and reciting prayers ever. Prayers with a devoted mind is that detergent that cleanses the mind of its dirt. The more we do, the cleaner our inner self will be. If you enjoyed this, please share it with all your friends and family. The driver of the other car whipped his head around and started yelling at us. My taxi driver just smiled and waved at the guy. And I mean, he was really friendly. So I asked, ‘Why did you just do that? This guy almost ruined your car and sent us to the hospital!’ This is when my taxi driver taught me what I now call, ‘The Law of the Garbage Truck’. He explained that many people are like garbage trucks. They run around full of garbage, full of frustration, full of anger, and full of disappointment. As their garbage piles up, they need a place to dump it and sometimes they’ll dump it on you. Don’t take it personally, just smile, wave, wish them well, and move on. Don’t take their garbage and spread it to other people at work, at home, or on the streets. The next “Feed the homeless” event will be at Cornerstones Day Centre in Manchester. We shall meet on Thursday 28th November 2013 at 6.30pm at Gurdwara in the evening to prepare all the ration for cooking / serving. Look forward to seeing you all on Thursday / Friday or both, to make this event a success and feed the homeless/needy with hot food when they need it most at this time of the year. This is from the Sikh Prayer, Japji Sahib, 16th verse. 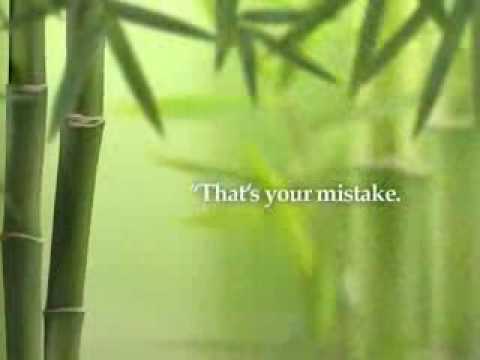 A King had a male servant who in all circumstances always said to him; My king, do not be discouraged because everything God does is perfect, no mistakes. One day, they went hunting and a wild animal attacked the king, the servant managed to kill the animal but couldn’t prevent his majesty from losing a finger. Furious and without showing gratitude, the King said; if God was good, I would not have been attacked and lost one finger. The servant replied; Despite all these things, I can only tell you that God is good and everything he does is perfect, he is never wrong. Outraged by the response, the king ordered the arrest of his servant. Later, he left for another hunt and was captured by savages who use human beings for sacrifice. In the altar, the savages found out that the king didn’t have one finger in place, he was released because he was considered not “complete” to be offered to the Gods. On his return to the palace, he authorized the release of his servant and said; “My friend, God was really good to me. I was almost killed but for lack of a single finger I was let go. But I have a question; If God is so good, why did He allow me to put you in jail?”. He replied; “My king, if I had gone with you, I would have been sacrificed because I have no missing finger. Everything God does is perfect and he is never wrong”. Please bless someone with it by sharing it. Everything happens for a reason, things do happen for our own Good. God is Great! A Little Wisdom goes a long way. When you give you will always get it back. Now, he started reading the deceased father’s will.Half of 18 = 9. So he gave the eldest son 9 camels. 1/3rd of 18 = 6. So he gave the middle son 6 camels. 1/9th of 18 = 2. So he gave the youngest son 2 camels. MORAL: The attitude of negotiation and problem solving is to find the 18th camel i.e. the common ground. Once a person is able to find the common ground, the issue is resolved. It is difficult at times. If you liked this story, please share with friends, family and children. You might spark a thought, inspire and possibly change a life forever!! Being the only Sikh – apart from my brother – in a school where the majority of pupils are Christian can be an interesting experience sometimes, as a lot of students are intrigued by the beliefs that Sikhs uphold and want to learn more. A fascinating incident occurred when I was standing in the lunch queue one day. A group of girls were standing behind me chatting enthusiastically about something. Suddenly, I felt a hand on my hair and heard, “It’s so long and soft!” I couldn’t resist turning around any longer to see what the fuss was all about and found myself gazing at some awestruck Sixth Form girls. Not ones to beat around the bush, they started questioning me at once. When the answer was no to both of them (I haven’t personally had the need to go to a hairdressers, so haven’t been to one), their faces lit up with awe. They found this really interesting. They had never thought about their hair in this light and probably just thought of their hair as a fashion accessory. It’s not just because of my long, uncut hair that I am recognised as a Sikh. I have never been shy of the fact I am a Sikh, and from the age of seven, I was always backing up my opinions with examples of what the Gurus have said. One of my teachers described my seven year old self as ‘proud to be a Sikh’! It’s pleasing to see that Sikhs are beginning to get understood, especially in our school, when not many people have even heard of the religion. However, outside the walls of our school, it’s not the same story. Sikhs have a unique physical appearance and after the devastating events of 9/11, a turban is sometimes associated with Osama bin Laden and his followers, in the minds of some. There is a history of hate crimes that have been committed post 9/11, many mistaking Sikhs, because of the turban, with followers of Laden. For example, the attack on the gurdwara in Wisconsin, USA, where six Sikhs were killed as a result of a gunman with white supremacist links. That wasn’t the only incident. Sikh-Americans have reported that they are often being targeted since 9/11 because of confusion with Muslims. It’s ironic that Guru Gobind Singh created the Five K’s so that Sikhs can be uniquely identified and now, because of one terrorist incident by another group in another land, we are becoming confused with other religions. As the youngest world religion, Sikhism is often perceived as being a branch of, or associated with more widely known religions like Hinduism and Islam. This has only made me more determined to make Sikhism as well-known and as correctly as possible. The prejudice that some people may have towards Sikhs, can only be eliminated by knowledge — accurate knowledge. Personally, my experiences have largely been positive of being a Sikh. However, these negative attacks have only made me more determined to get Sikhi recognized as much as possible in our school and made me stronger in what I believe in. In a world that is becoming increasingly image-obsessed, we Sikhs may look different, but that is because of our beliefs, we are not any different otherwise. Take Balpreet Kaur as an example. Not too long ago, she was taunted by a blogger, because she, being a Sikh, did not shave or cut her hair. The man was so astonished by the fact that women have hair on their bodies and faces that he posted her photo online and waited for the abuse to flood in.